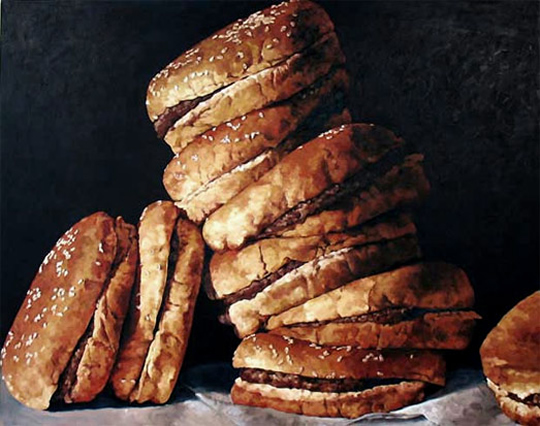 “BURGERS II," Pamela Michelle Johnson, 2007, Photo by permission. 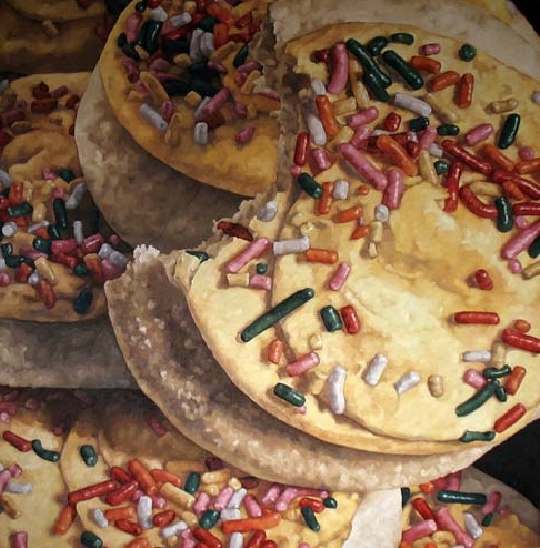 “American Still-Life” by civil engineer-turned-artist Pamela Michelle Johnson is a series of larger than life paintings that depicts our most gluttonous American indulgences. 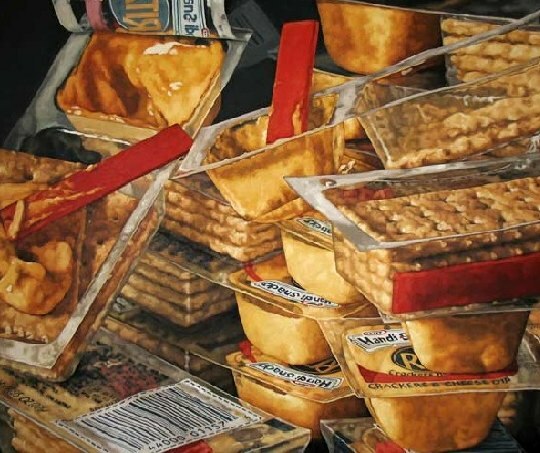 Based in Chicago, Johnson uses photo-realism to create her work by first photographing her subjects, and then sketching and painting them on canvas. The works are massive, standing between five to six feet in height. Each painting takes about two months to complete. 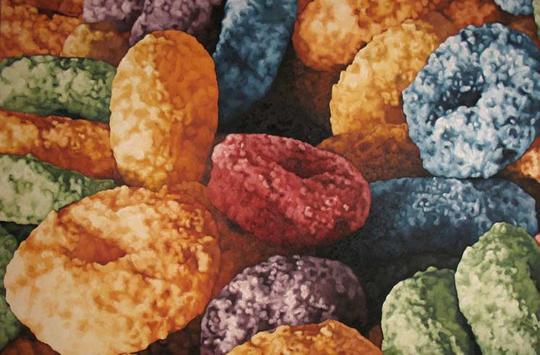 “FROOT LOOPS," Pamela Michelle Johnson, 2008, Photo by permission. Through my work, I strive to invoke reflection on a culture focused on mass-consumption and mass-production, where the negative aspects of overindulgence are often forgotten or ignored. The work flaunts our culture back at us. It questions embracing a culture of complete and instant gratification while ignoring the consequences of our indulgences. 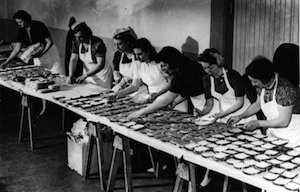 The work questions many of our cultural ideals and social norms. These are the pictures of our insatiable appetites; they are the pictures of the consequences. 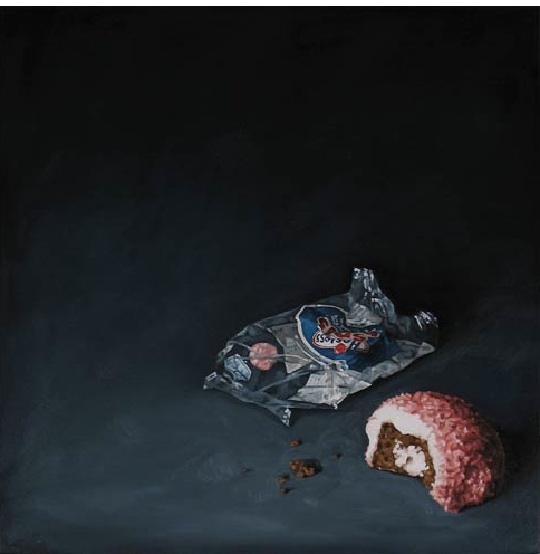 Overbearing scale and gluttonous quantities, juxtaposed against foods that are both tempting and comforting, examine the conflict between enjoying the highly processed, artificially flavored bounty of American life and the progression to overindulgence and gluttonous excess. The work is both gross and enticing. 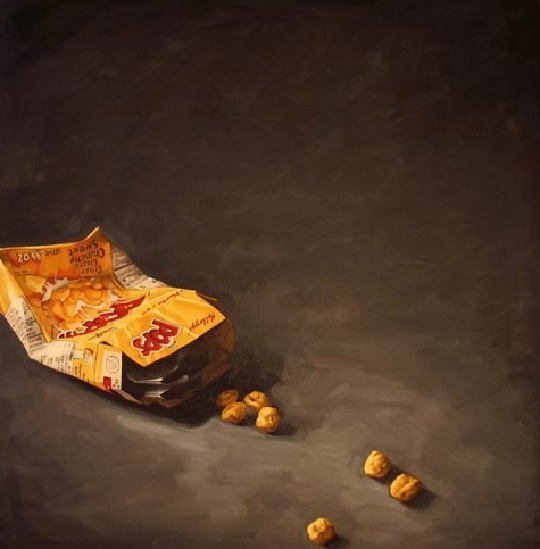 “HANDI SNACKS," Pamela Michelle Johnson, 2008, Photo by permission. Because I feel my work is a mirror to and a comment on American culture, I wanted to update my work to reflect some of the recent changes in our economy. Instead of being just showing the overindulgence and gluttony of our culture, I wanted to reflect where we are now that our economy has tanked. It seems that now we are left with just the garbage resulting from our indulgent lifestyle. Johnson's paintings are available for purchase by contacting her through her website, but if you'd like to see them for yourself, you should join her mailing list to receive information regarding future public shows. 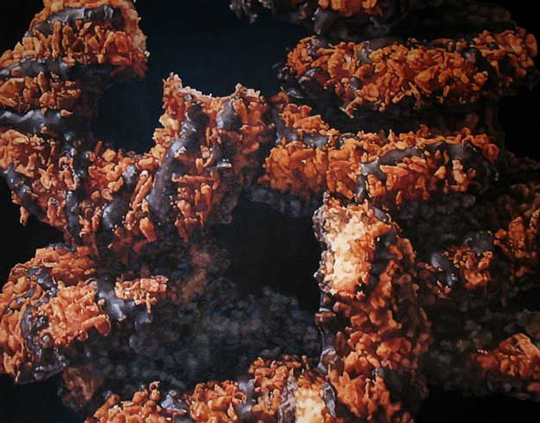 “GIRL SCOUT COOKIES,” Pamela Michelle Johnson, 2007, Photo by permission. 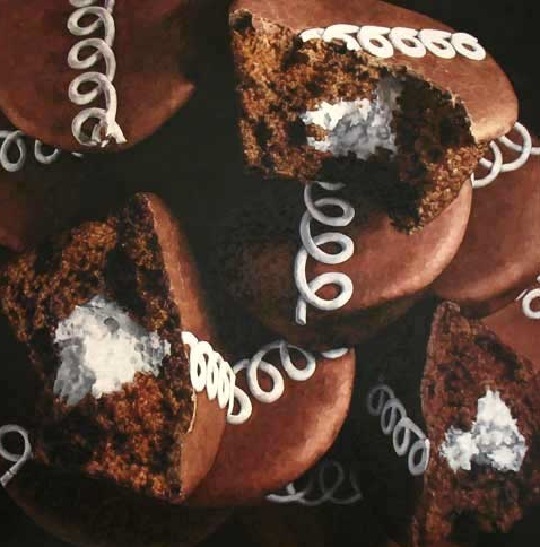 “HOSTESS CUPCAKES,” Pamela Michelle Johnson, 2007, Photo by permission. 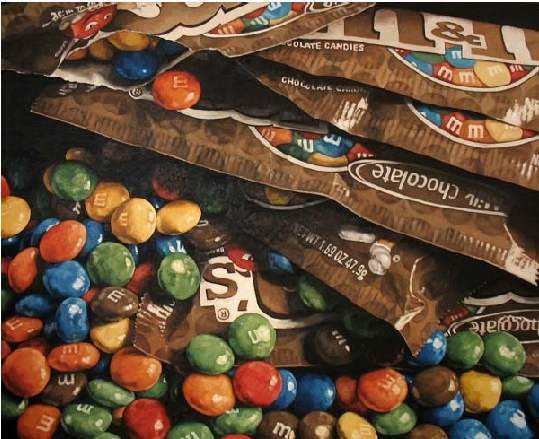 “M&M’s,” Pamela Michelle Johnson, 2008, Photo by permission. “CIRCUS ANIMALS,” Pamela Michelle Johnson, 2008, Photo by permission. 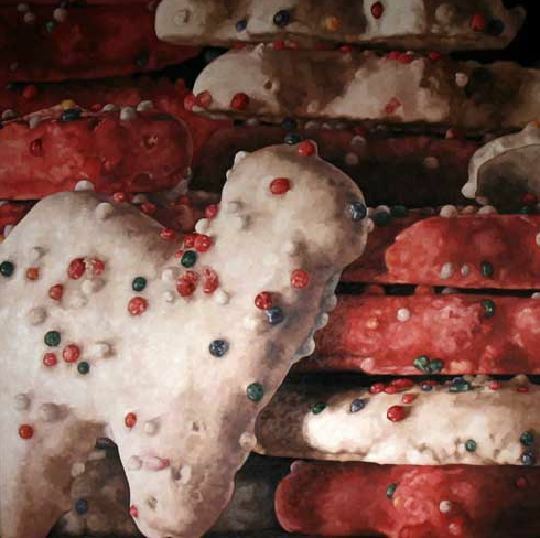 “SUGAR COOKIES,” Pamela Michelle Johnson, 2008, Photo by permission. “GUMMI BEARS,” Pamela Michelle Johnson, 2008, Photo by permission. 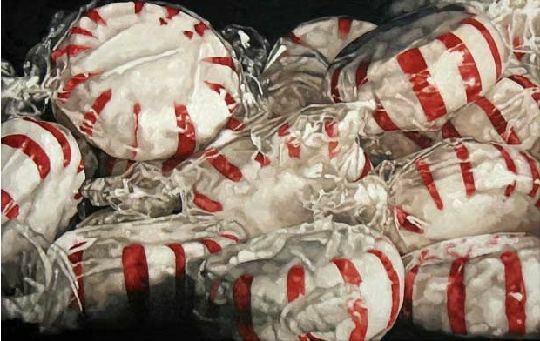 “STARLIGHT MINTS,” Pamela Michelle Johnson, 2008, Photo by permission. 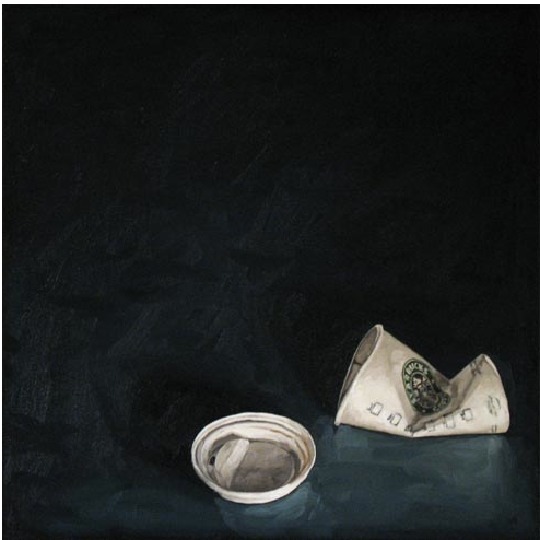 “UNTITLED,” Pamela Michelle Johnson, 2009, Photo by permission. “SNOWBALL, PINK,” Pamela Michelle Johnson, 2009, Photo by permission. “POPS,” Pamela Michelle Johnson, 2009, Photo by permission. 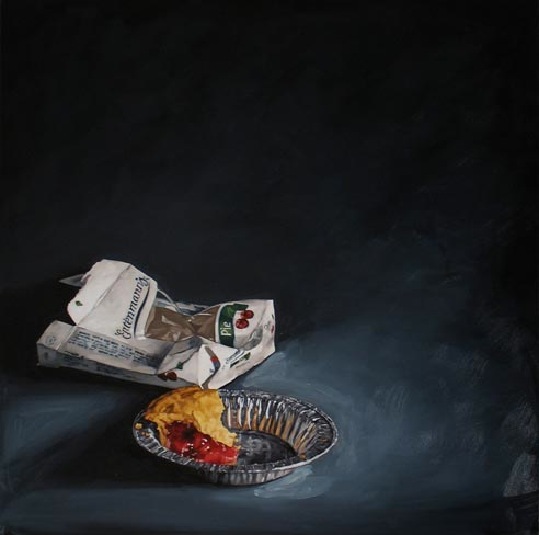 “ENTENMANNS PIE,” Pamela Michelle Johnson, 2009, Photo by permission. 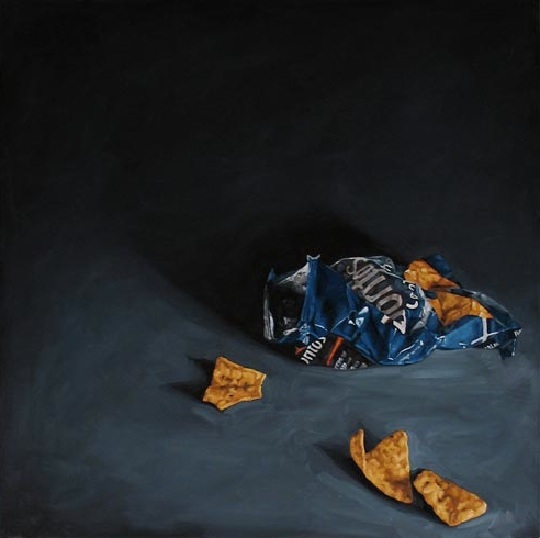 “COOL RANCH,” Pamela Michelle Johnson, 2009, Photo by permission. These are surprisingly desolate. The artist definitely succeeded at evoking feelings of futility and solitude. Don't know if that's what she was going for, but that's how this makes me feel. I would never have thought I would find such still life work attractive but, Wow! I think there is some beautiful work here. She's done some amazing work.